Shirley Peacock Webb, 87, passed away on Saturday, November 10, 2018 at Wayne UNC Healthcare. Shirley was born in Greene County on August 30, 1931 to the late Bernie and Belle Oglesby Peacock. She was married for 56 years to the late Sam Webb. Shirley worked as a Certified Nurse’s Assistant with Wayne Memorial Hospital and retired after 30 years of service. She also enjoyed yard work and gardening, as reflected by her beautiful yard. 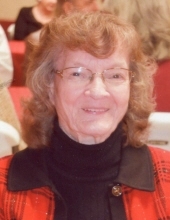 Shirley loved Grace Baptist Church and was a dedicated and faithful servant. She had a large extended circle of family and friends and they were all very special to her. She will be missed, but greatly remembered. The family will receive friends on Wednesday, November 14, 2018 from 5:00 – 7:00 p.m. at Grace Baptist Church followed by a service to celebrate Shirley’s Christian life at 7:00 p.m. in the sanctuary with Rev. Jason Stoeber officiating. Interment will be on Thursday, November 15, 2018 at 11:00 a.m. in Evergreen Memorial Cemetery. At other times the family will be at the home of her son and daughter-in-law, Ronnie and Brenda Webb. Shirley is survived by her sons, Ronnie Webb and wife Brenda of Goldsboro and Tony Webb of Goldsboro and three grandchildren, Timmy Webb, David Webb and Brian Platt. She is also survived by her sisters, Melva Taylor of Ayden, Janet Sharpe of Chesapeake, VA and Pearl Olds of Chesapeake, VA. In addition to her husband and parents, she was preceded in death by her son, Durwood Webb; infant daughter, Beverly Webb; brother, Earl Peacock and sister, Bernice Jones. Flowers are welcome or memorials may be made to Cures for the Colors, SMOC, 203 Cox Blvd., Goldsboro, NC 27534. To send flowers or a remembrance gift to the family of Shirley Peacock Webb, please visit our Tribute Store. "Email Address" would like to share the life celebration of Shirley Peacock Webb. Click on the "link" to go to share a favorite memory or leave a condolence message for the family.